Girl get your power back! Synopsis: Tasha and Melanie are having a hard time dealing with their momma’s death due to domestic violence. Tasha is struggling in her relationship, and Devonte is coping with his insecurities as a man. Aunt Mary Lee- Early 60’s African American female who has raised her sister kids and finds out the secrets they all been hiding. Grace- Early 60’s Aunt Mary Lee best friend and comedian. Devonte- Early 30’s African American Male, Tasha’s boyfriend who is very abusive verbally and physically. Tasha- Early 20’s African American female who is in an abusive relationship and is jealous of her scholar sister Melanie. 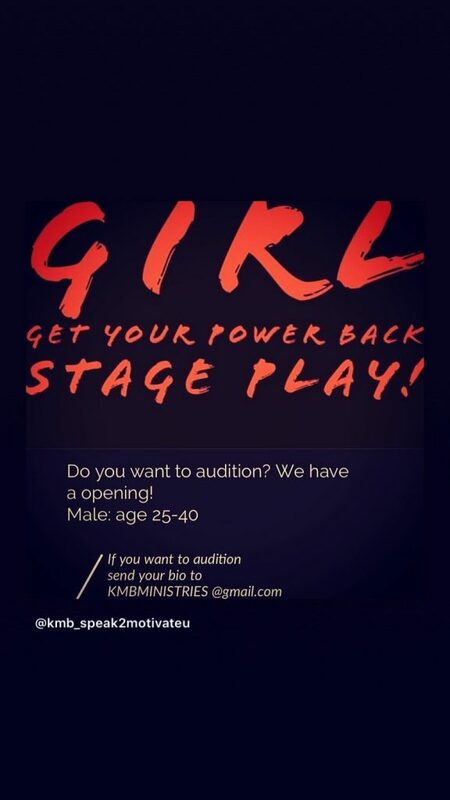 This casting notice was posted by: Keisha Brown.